Friday night and time for an adult beverage. 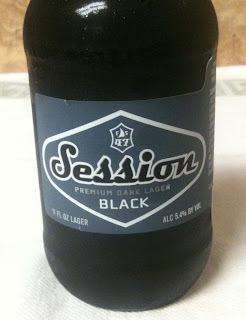 Today it will be Session Black, Premium Dark Lager, from Full Sail Brewing Company. The 11 ounce bottle shows 5.4% ABV. The web site lists IBUs at 18. This beer poured with a small, rich brown head. Beer color is a dark reddish brown which lets very little light through the glass. Nice aroma with a lot of caramel/toffee/brown sugar. Maybe a little cocoa. The taste has some cocoa, but not as much sweetness as was implied in the aroma. Smoky, roasted malt. Medium bodied. Leaves you with a little of that smoky, cocoa taste and feeling on your tongue. 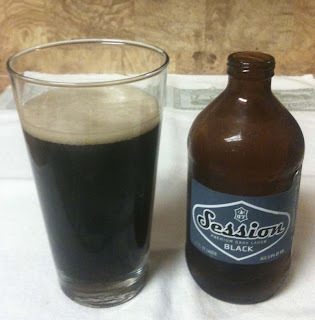 This is a nice, flavorful beer that makes you think more of a porter or a stout than a lager.